Susan Coleman in her kitchen. 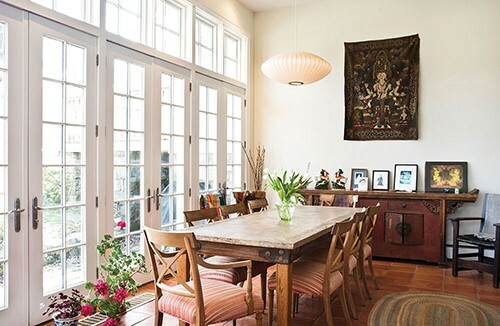 Once the home's former den, she added a kitchen island, ceramic tiles, and French doors leading to a bluestone patio—all of it looking out over the property's lake and woods. 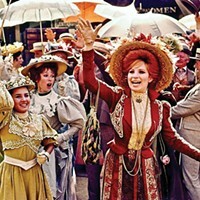 "I recently heard a historian explain that men finally stopped dueling when women started laughing when they dueled. Women have a lot of power. Empowering women, especially, leads to more peace. Like the ladies of medieval legend who encouraged knights and kings away from "might makes right" toward a code of chivalry, Susan Coleman believes in the power of women to create a more just and peaceful world. She believes that men and women can collaborate on even the most polarizing issues—from ancient territorial disputes to reproductive rights—influencing their communities for the better. There is nothing fanciful about the way Coleman implements these beliefs, however. "I'm a lawyer, mediator, large-group facilitator, team and systems coach," she explains, adding: "And now a podcaster." Over her three-decad- long career Coleman has developed and utilized communication tools, people skills and team-building exercises to find common ground; helping communities, corporate teams, and even warring factions to come together, resolve issues, and grow from their conflicts. It's a career that's taken her across the globe from Colombia to Uganda to, most recently, Afghanistan and Tajikistan. Working with the Hudson Highlands Land Trust, Coleman placed a conservation easement on the 38 acres of woods surrounding her home—ensuring they would be preserved in perpetuity. 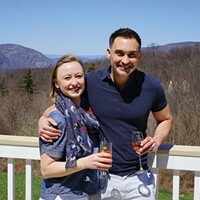 While her work involves the stuff of nightly news reports, the home she's returned to in the Hudson Highlands could be the setting for an Arthurian legend. 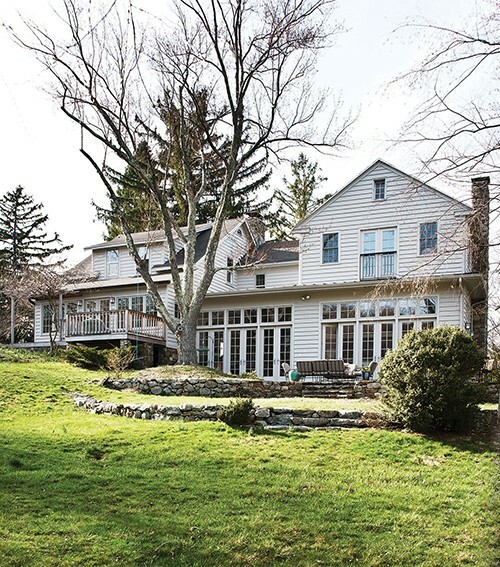 The light grey colonial, surrounded by gardens, flowering trees, and 38 acres of forever wild woods, abuts a small lake, views of which permeant almost every room in her house. It's a place of peace. It's a place where the day-to-day business of the world recedes for a moment, leaving time to row across the misty water or walk through the deep, seemingly endless woods. (From her hiking trails, Coleman even knows a shortcut to the Appalachian Trail.) It's the place from which she's built a career facing some of the world's most recalcitrant issues, and the nexus of her newest venture: "The Peace Building Podcast." "We never changed the footprint," Coleman tells me as she guides me though the 3,000-plus-square-foot home. "When we moved here, however, the layout was very idiosyncratic" At that time, the front door opened straight into the large living room. At the back of the house, the original kitchen was small, and a stairway, tucked in the corner, lead to the four upstairs bedrooms—all dating from circa 100 years ago. A 1940s split-level addition, led down to a den ("It was so dark—you couldn't see outside at all," she recalls) and up to another sitting area. Coleman in her "do-jo" (industry lingo for a sound proof booth) set up in her office. The Peace Building Broadcast features interviews with coaches, mediators, and all types of negotiators involved in peace-buildling initiatives across the globe. In the past few years, Coleman has become especially interested in "bringing the feminine into the field of international relations." Originally from Long Island, Coleman had begun her career as an attorney in Manhattan, but left when she found practicing law too impersonal and competitive. After enrolling in Harvard's Kennedy School for Government, she discovered their program on negotiation. "It just grabbed me," Coleman remembers, "I am forever interested in groups and the way they operate." 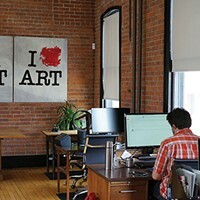 She liked how it combined her interest in Gestalt therapy with organizational design and found it an antidote to the litigation system, which she realized had its limits in actually resolving issues. "The key to mediation comes down to creating a good container for conversation. With that, you can have really wonderful conversations with people who think very differently than you." The move to Garrison from New York was propelled by her need for a more peaceful lifestyle and open space for her young family to grow into. While the interior needed upgrading, Coleman loved the surrounding woods and lake. Her children, two and five at the time, first questioned and then delighted in the landscape they were suddenly free to roam. "I remember them looking at us, questioning 'can we really go more than 10 feet away?'" Soon, they were scrambling over rocks and exploring the woods—getting to know every inch of the new terrain. 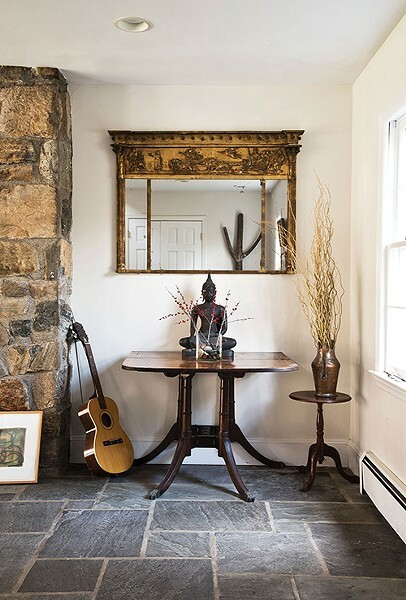 The bluestone-tiled entrance to Susan Coleman's 4,000 square-foot Colonial. Coleman, a mediator who focuses on international conflict resolution, regularly travels the world to help large groups and small negotiate their way towards peace. Her home is decorated with mementos from her journeys. "I'm all about integration," she explains, "and helping people with difficult conversations. When handled in the right way, those difficult conversations can be transformative." Over the next 20 years, Coleman ran her Garrison household and raised children with one hand while building her career as a mediator specializing in international conflict resolution with the other. She designed the first negotiation and mediation program for the United Nations Secretariat. She cocreated Columbia Teacher College's first certification program for conflict resolution. She worked everywhere from NASA to the boardroom of American Express, and with every kind of team, from the New York City School Board to the Colombian government, helping groups become more constructive in their conversations and utilizing team-building skills to help resolve differences. Along the way, she realized that, with the right tools, not only could conflicts be resolved, they often also yielded unexpected benefits. "If you use conflict well, you can actually use it to reshape things and go higher," she says. Her home in Garrison also evolved. By taking an axe to interior walls and adding windows, it became the light-filled, open, and inviting space it is today. She began by creating a large entryway at the home's front door, and then opening the stairways and hall leading from the bluestone tiled area to the various wings of the house. The original living room, with its stone fireplace and wood paneled walls, remained the same cozy nook. However, the old kitchen was torn out and a wall of windows and French doors were added, creating a large sitting area opening onto a wooden deck. 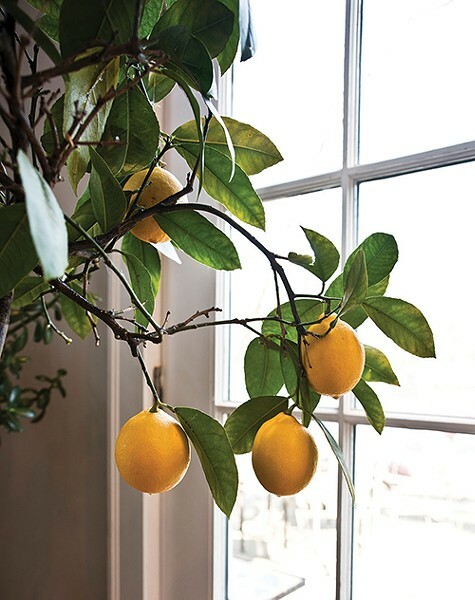 A lemon tree adds a colorful accent to Coleman's home. Coleman also tore out the wall that closed off the downstairs den and replaced the back, exterior wall with a row of French doors. 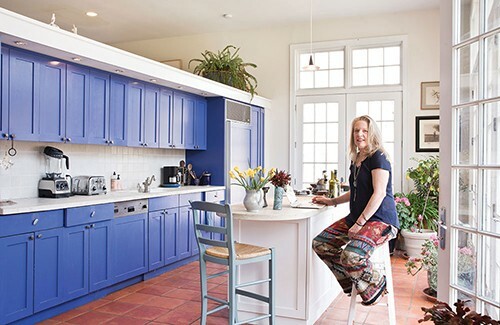 She installed an bright blue kitchen at one end of the space and, at the other, a dining area with an eight-seat wooden table, all offering sumptuous views of the lake and woods. A ceramic tile floor completes the interior space and compliments a blue stone patio built right outside, skirting the kitchen and dining area and creating a natural flow from inside to outdoors. From the entranceway, a staircase leads to an upstairs wing of bedrooms. A lofted landing, open to the downstairs with bookshelves built into the recesses around the stone chimney, serves as a library. Pictures of her children—now grown and launched on their own adventures—still decorate the three upstairs bedrooms. Coleman's large master suite has a full green tiled bathroom and a Juliet balcony over looking the lake, allowing her to enjoy the breezes and rustling of the night woods in the warmer months. Coleman's most recent work has focused on the power of women to shape a more peaceful world. "I believe women are often inherently more collaborative," she explains. "Empowering women—both economically and to have a voice—is one of the most efficient and impactful peace-building steps we can take." The light-filled dining area offers sumptuous views of the lake and woods surrounding the house. Her most recent mission was a boots-on-the-ground lesson in this philosophy. Traveling to Tajikistan and Afghanistan, she worked with The Fierce Mothers of Afghanistan—a group of female civil servants committed to fighting government corruption. Although the women come from an array of tribal backgrounds and ethnic groups, they are unified in their commitment to building a better country for themselves and their children. Coleman worked with them to create trust within their group, move past their various ethnic and political allegiances, and develop public speaking skills so they could have a better voice within their families and in their government. "These women were so incredibly powerful, and had so much integrity and intelligence—I was humbled by them," Coleman says. From the home's entrance, another stairwell leads to Coleman's office space. 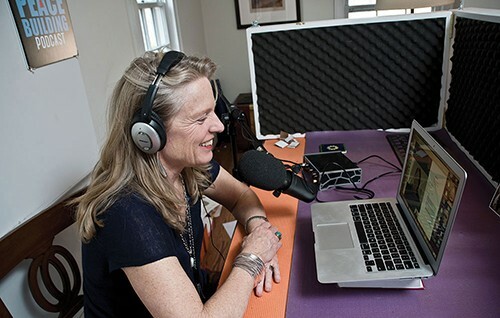 It's where Coleman runs her mediation, coaching, and team-building business Susan Coleman Global and where she's launched her latest endeavor: "The Peace-Building Podcast." From a small recording booth built in one corner, Coleman interviews peace builders from all over the world. "It's a mediator's lens," she says, exploring ways in which people across the globe are building and sustaining collaboration. Downloaded and listened to in 36 countries and counting and drawing on her connections throughout the world, it's quickly becoming a nexus of peace builders—especially women—who are working against fierce odds to shape a more equitable world. "My focus now is on women and peace building," Coleman explains. Through her podcast, Coleman has connected her new Afghani friends to women involved in the Colombian peace process and women integral to the peace process in Northern Ireland. "So many of us are fierce mothers," she explains, "and we have a tremendous power to change our communities. Peace is within our grasp."